Chris Skinner is a numerical modeler at the University of Hull (UK) with experiences ranging from hydrometeorology to geomorphology. He is particularly interested in how sediment processes contribute to the evolution of flood risk. He is also a keen science communicator and leads the SeriousGeoGames Lab, which uses new and emerging technologies to share research. His fellowship funded by the University of Hull will draw on all these experiences to develop a novel modelling framework that forecasts sediment impact on flood risk and to share this information to communities at risk. 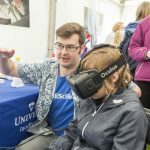 The University of Hull was privileged to host the annual British Science Festival in 2018. One of the key events was the Huxley Debate, which brings together world-leading experts to discuss a pressing issue facing society. The theme in Hull was “what do we do about ocean plastics?”. As part of the discussion, Professor Dan Parsons, Director of the Energy and Environment Institute, suggested that in the future we will see the evidence of our plastic waste in the sedimentary record, and that the emergence of this in the record could mark the boundary between Holocene and Anthropocene. Professor Parson’s suggestion prompted one journalist to remark, in jest, that a better name for the new epoch would be “the plastocene”. It may have been a moment of mirth, but the feasibility of the emergence of the plastocene should not be discounted. Plastic pollution is a huge issue. You will have undoubtedly heard the key statistics over and over by now – 12 million tonnes of the stuff enters the world’s oceans every year, and at that rate there will be more plastic than fish in them by 2050. Plastic is designed to be virtually indestructible and never really disappears, instead breaking down into smaller and smaller pieces. It is possible that the only way we will ever get it out of the oceans is to wait for it to settle on the ocean floor and be buried – something we might be waiting a long time for – it floats. Plastic deposits are already being found – some have useful (but unwelcome) side-effects such as marking the extents of flood events by forming wrack lines. For example, rubbish deposited by storms and tsunamis has been used to date the events (using packaging and labels) and determine the flood extents. On a recent visit to the south of Spain as part of an undergraduate field trip I observed wrack lines formed of tiny fragments of multi-coloured plastic. Such deposits can get buried, preserving the records with them. 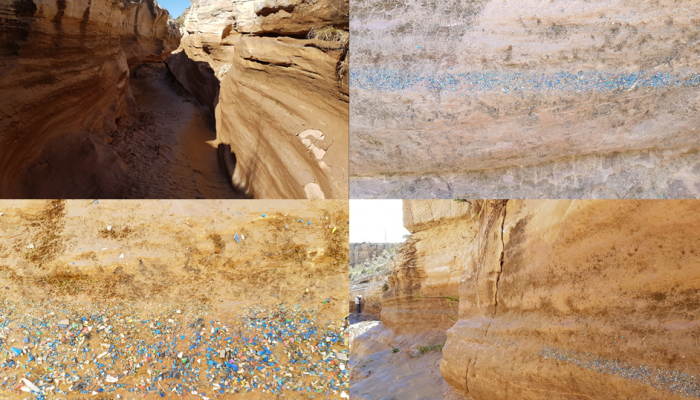 Plastic wrack lines left behind in a dry river in the south of Spain (Authors own photos). Simon Reeve’s documentary ‘Mediterranean’ highlighted the issue of microplastics in this region of Spain, showing plastic sheeting buried within a dried river bed. Plastics have already been found being formed into rocks. Corcoran et al (2015) observed a new type of rock dubbed ‘plastiglomerates’ around the beaches of Hawaii. They formed when plastics melted and fused with natural materials, such as beach deposits and volcanic rocks. They found no evidence of recent lava flows so suggested that the plastiglomerates were formed by the deliberate burning of the plastics. 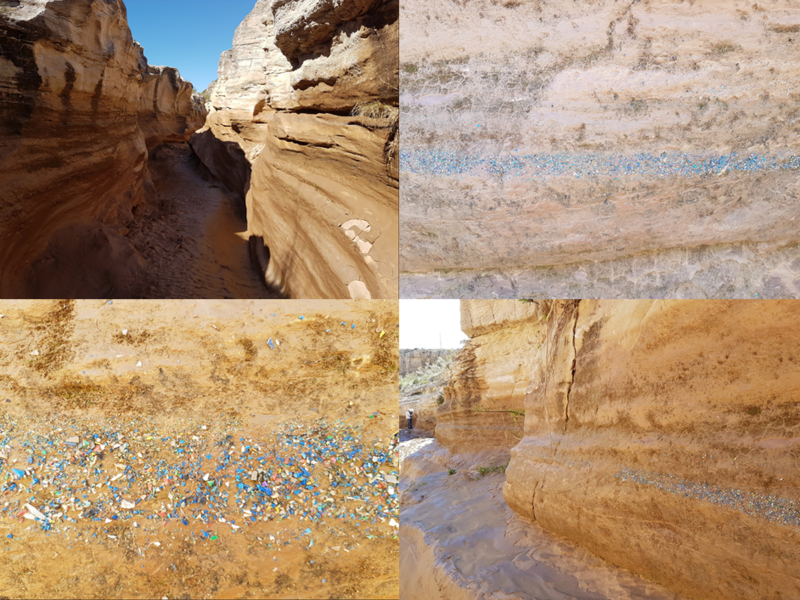 The lithification processes behind beach and marine carbonate cementation can be extremely rapid, forming rocks in as little as a year, which means evidence of human activity is preserved and can be used for dating – examples include glass drink bottles and World War II debris. In the future we could end up seeing plastics preserved in these carbonate cements. However, despite all of this it is unlikely our ancestors, or whatever might inherit the planet from us, will observe this period of the sedimentary record and refer to it as the plastocene. Plastic pollution is not the only pressure we are exerting on the planet, it is not even the most significant. We have also been making our mark on the sedimentary record for millennia, with the earliest mining and smelting activities resulting in spikes of lead in deposits to the nuclear tests of the 1950s leaving an imprint of Plutonium 239. We cannot isolate plastics from our impact on what truly is the Anthropocene. 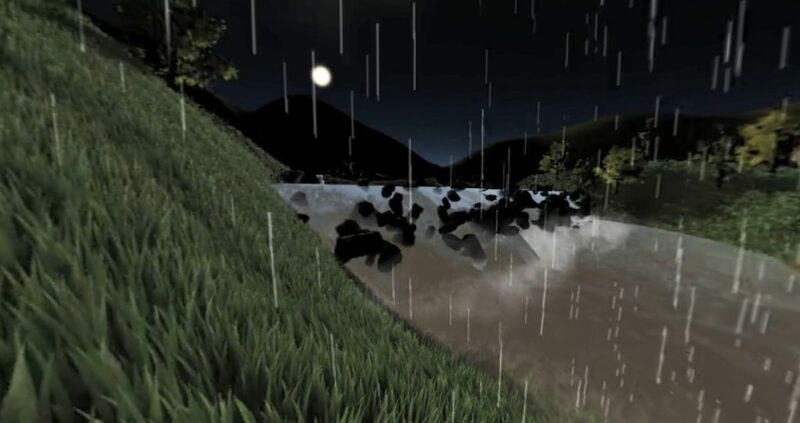 When we think about how our landscapes evolve and change we probably tend to go straight for the big stuff, things like the climate, tectonics or geology, and in my previous blog I looked at how rainfall contributes to changing the planet’s surface. However, it is not just the big stuff which controls these changes, smaller things do as well, for example changes in land cover (ie, from grasses to trees, or the other way round) results in changes in the patterns of erosion and deposition, not just in the areas where the land cover changed but also further along a system. There are also several examples of how animals can influence the processes driving landscape changes too. In Yellowstone Park, USA, the hydrological conditions in the area changed when the main predator, the grey wolf, disappeared from the area causing a knock-on effect on grazers removing sapling trees which in turn stops woodland reaching maturity resulting in a change in land cover. To try and reverse this the grey wolf was reintroduced but so far has not been successful returning the system to its former state. Recently it has been shown how spawning Pacific salmon can make localised changes to river channels and increase the ability of flows to erode the river, impacting the whole river profile. But let’s get even smaller, right down to the smallest living things on Earth. Surely things like bacteria cannot influence how landscapes evolve over long periods of time? Well, think again. Serena Teasdale is an Early Career Researcher who works with me at the University of Hull, and she is researching how bacteria can change the erosion rates of shorelines. “Often when we consider the role of biology, our initial assumption is that of vegetation. However, studies have begun to highlight the fundamental importance of EPS [technical way of saying slime, more on this later – Chris] on driving sediment behaviour, notably stabilising sediment and enhancing the erosion threshold. This occurs as the EPS matrix, secreted by microorganisms, forms bridging structures between sediment particles which prevent them from moving freely” she tells me. Serena has developed a really neat demonstration to show the impact this slime can have on the resilience of sediment – she uses sandcastles. It’s simple but highly effective. One sandcastle is made using normal sand and a second has been mixed with xanthan gum, a proxy for this slime and it is commonly used as a binding agent in fat free mayonnaise. She pours water from a watering can over both and times how long it takes for them to fall apart – it is clear that the one full of slime takes much longer to collapse. This slime is actually called Extracellular Polymeric Substances (EPS) and whilst this might sound like something made up for the Ghostbusters’ franchise it exerts huge influence over landforms. 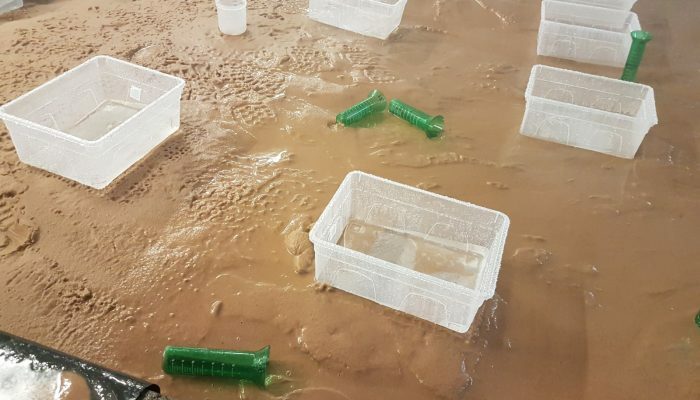 Physical experiments have shown that mixing sand and mud with different volumes of the xanthan gum proxy, and you only need a tiny amount, can shift river bed landforms from dunes, to ripples, to flat beds. It means our current models of interpreting past environments from buried bed forms might be wrong as these have not considered the effects of the bacterial slime. Comparisons of two deltas – both the same discharge but the right has low cohesion (stickiness) and the left high. Josh has created an interactive display using animations of his modelling to show the impacts of river discharges and ‘stickiness’ on the developing shape and channel networks on deltas. In it you can choose low, medium and high levels of both and it shows you the result. Above we can see a low stickiness and high stickiness delta for medium discharges. So next time you are out in the pristine landscape and considering just how it came to be, don’t just dwell on the big stuff, it might be all because of bacteria snot. Isn’t nature beautiful? I like rain. Being British, this is a useful trait. It’s also what led me to do a PhD in Hydrometeorology. Since then, I have researched in hydrology, hydraulics, geomorphology, and more recently I have dabbled in sedimentology. Yet, the common theme through all of my research has been rain. I think it’s often underappreciated by those of us more interested in dry stuff like sediment and rocks, but speak to any hydrometeorologist or hydrologist and they will be able to tell you at length just how troublesome the wet stuff is. For starters there is no accurate way to even tell how much is falling over an area, and this has led to some creative methods of measuring it, mainly from EGU stalwart, Rolf Hut. Another issue is that it doesn’t just come in one type and each can have a different impact on sediments. Frontal rain is miserable and can bring day after day of rain, adding a lot of water to the land but spread out over a long time this is often not enough to have an impact the land surface. Convective rainfall can be extremely heavy, extremely localised, and can have huge impacts on the land – just look at the recent flooding in Coverack, UK. This complicates things – we like to lump rainfall together and climatically we think about mean annual totals. However, by shifting the balance from low- to medium-intensity frontal rain to high-intensity convective rain it is possible that with no change in the mean annual totals there will be an increase in geomorphic activity. It is even possible that the mean annual rainfall total could decrease, but if summer convective storms increase in frequency and magnitude, the sediment yields of catchments will increase. To try and simplify this, the variability of rainfall often has a greater impact on sediment processes than the amount of rainfall. This can also influence the shapes of landscapes and how they develop – in my work with Professor Tom Coulthard we showed how using the same rainfall totals at different spatial and temporal resolutions impacted the sediment yields predicted by the CAESAR-Lisflood model. We found that when using the finest resolution, the sediment yields could be more than double those using a daily total and spatial homogenous rainfall rates – this could be taken as analogous of the same rainfall totals applied as convective and frontal. Over 1000 years of simulation the convective higher-resolution data produced more erosion higher up in the catchment, and increase deposition in the valley floors. I wanted to follow this up by seeing if we could get similar results using a sediment flume. However, I’ve been beaten to it by the CatchyRain group from Wageningen University who have been conducted experiments via the Hydralab+ programme. Fortunately, they conducted their experiments using the Total Environment Simulator at my University, Hull, and they kindly let me visit and film some of it on my 360 camera – in the video below I speak to Dr Jantiene Baartman, Assistant Professor from Wageningen University. You will also see others involved in the test, such as Dr Martine van der Ploeg, and Hull’s Dr Hannah Williams and Dr Wietse van de Lageweg. To get the best effect out of this video, view it on a mobile device via the YouTube app. 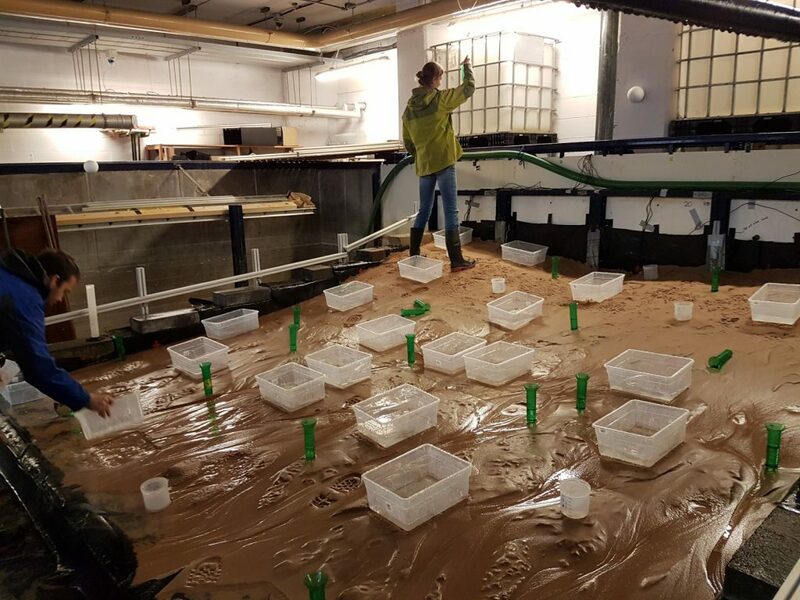 What the Wageningen and Hydralab+ team will hopefully show is that even the same volume of rainfall falling on a catchment will produce different patterns of sediment processes due to the variability in intensities. I am really looking forward to seeing the results presented at EGU 2018, for example this Highlight presentation by Hannah. This is just the tip of the iceberg in terms of how complicated rainfall is and how its variations and variability can influence landscapes. I haven’t had chance to open the Pandora’s Box of how the uncertainty in rainfall estimations can cascade through modelling processes – maybe another blog for another time. In the meantime, I hope I will have inspired you to think about rain a little more and for EGU 2018 I would highly recommend a visit to the HEPEX sessions.